Chris and Howard purchased stock in a small medical service company several years ago. The company has done well. A larger company is now discussing the possibility of buying the smaller company. Chris and Howard are looking for a way to save taxes. Chris: We were fortunate to invest in the medical services company. Over the years, medical services have become more and more important, especially for senior Americans. We thought this stock would grow and, indeed, it has increased in value. We paid about $50,000 for the stock and it is now worth $400,000. If we were to sell the stock, we would pay a large tax. It looks like the company may be sold to a larger company. There is no sale agreement yet, but it could happen in the future. We have always talked about taking part of that stock and buying a vacation home. I have found a very nice summer cottage on a nearby lake. The price is approximately $120,000. We checked with our CPA. 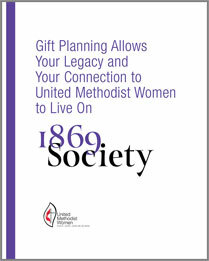 He suggested that we talk to a gift planner at United Methodist Women. We were happy to discover that we could transfer $280,000 worth of the stock into a special trust called a charitable remainder unitrust. The unitrust could then sell the stock tax free. Howard: Best of all, we were able to sell the other $120,000 of the stock for cash. The deduction on the charitable trust saved enough in tax so that we did not have to pay tax on the $120,000. The full $120,000 was available to purchase our lake home. Chris: This was a wonderful arrangement. I am pleased that we were able to set up the unitrust. We now have income and are enjoying our lake home.